Scooter Advertising displays your message in a unique manner that will catch attention on the street and sidewalk level. Scooter ads are highly effective in concentrated downtown, Main Street, and campus areas. Some special event ideas include: conventions, festivals, sporting events and parades. 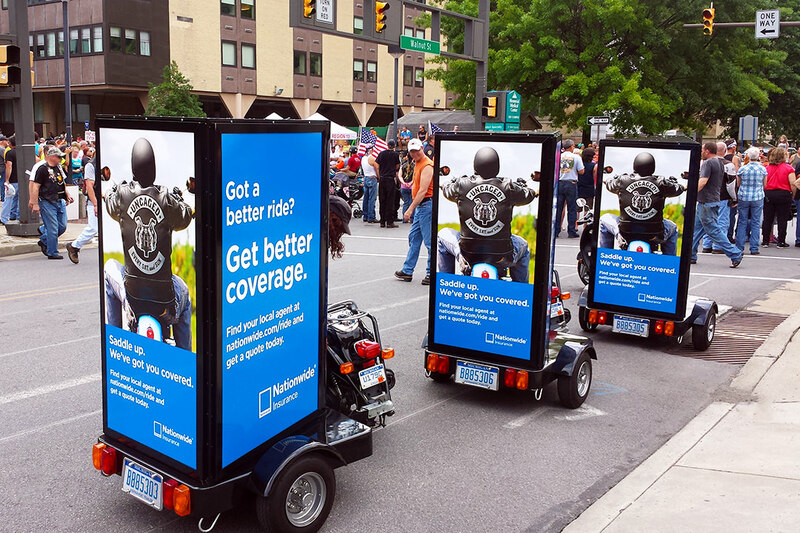 Scooters with advertising trailers in tow create brand awareness with bold graphics and brand ambassadors. 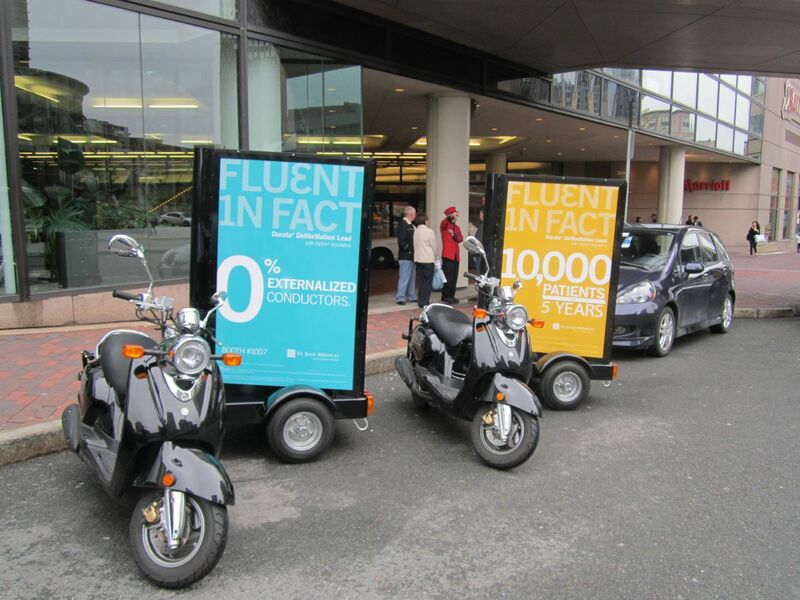 The Scooter team can also work in conjunction with a mobile billboard campaign. Nationwide coverage is available for our scooter billboards. 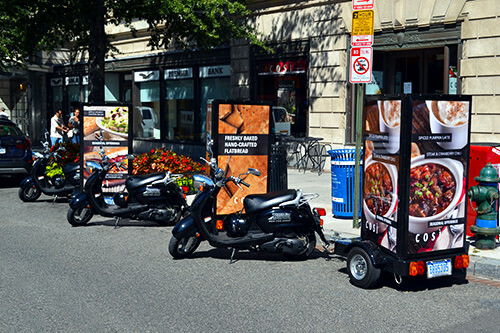 The Ad-Scooters and brand ambassadors are transported between markets using our custom enclosed trailers capable of moving teams of up to 6 units. Traffic Displays’ takes pride in the high quality fabrication and simple, attractive design that we used to manufacture our scooter trailers. 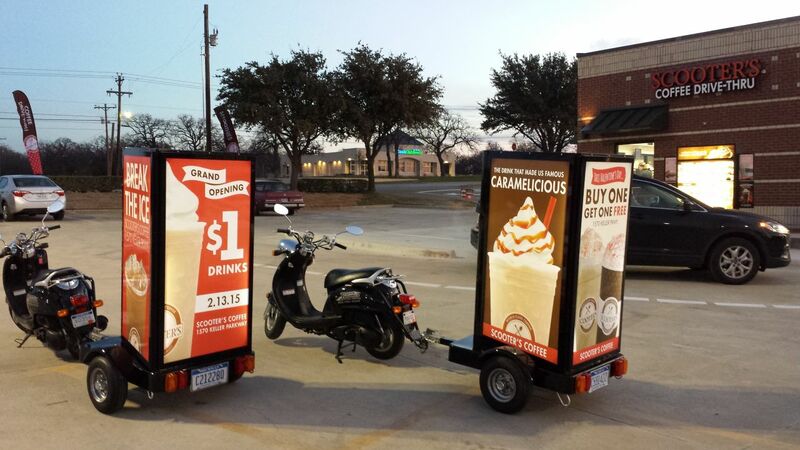 Each 3-sided backlit ad-trailer is towed by a sleek black scooter. Our street teams are dispatched in a squad of up to 5 scooters at a time. The teams then zip along busy downtown streets to reach your target audience. These eco-friendly advertising scooters can operate all day long on less than 1 gallon of fuel. Our professional riders possess cycle endorsements and are trained to safely maneuver the scooters with billboards in tow. The enthusiastic operators on board become brand ambassadors when outfitted in customized uniforms in sync with the advertising display. 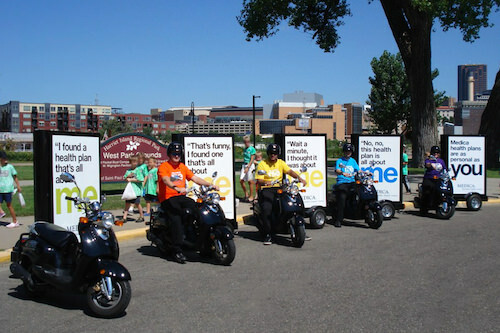 Scooter Ads can act as a marketing street team of their own by distributing promotional items while stopped along the route or when staged at special events. The sign faces are printed on self-adhesive vinyl that is mounted to an acrylic substrate. These panels can be viewed from all angles while in traffic and are also fully illuminated to target the nightlife crowd into the evening hours. Our high resolution printing will bring your advertisement to life for maximum impact on the target audience. Once produced, the scooter sign panels can be saved for future advertising campaigns. When you contract with us for your scooter billboard advertising we will provide photographs taken in the areas you wished to target.